Woods Hole terminal remains a work in progress. After more than 400 people signed a petition protesting the design concept for a new Steamship Authority ticket building in Woods Hole, the boat line has asked its architects to try again — and given them a sheaf of public comments to consider. 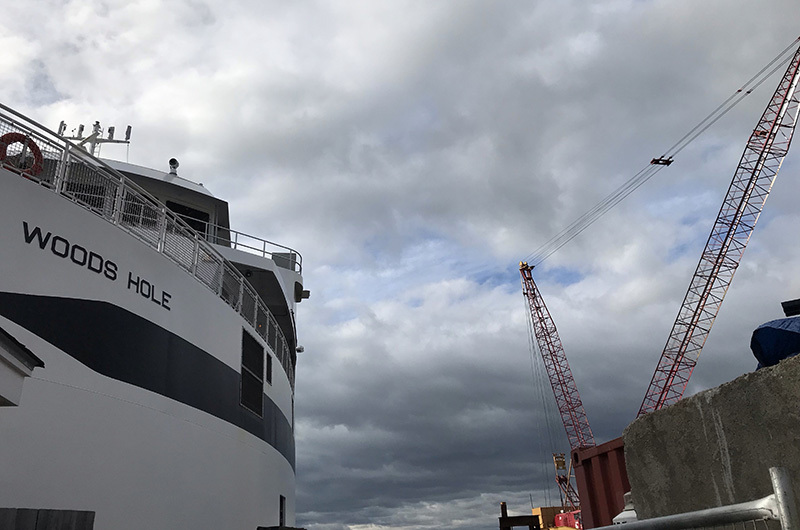 “We have to get them to back up and put as much fresh on the table as possible,” said Steven M. Sayers, who retired this year as general counsel for the Steamship Authority but remains on the management staff part-time. Residents on both sides of Vineyard Sound have roundly criticized the bulk, profile, materials and use of space in the building design by Boston-based Bertaux + Iwerks Architects, many of them in comments appended to the petition. “We are listening to those comments,” said Mr. Sayers, who distributed a three-page outline of the objections and recommendations from petition signers at Wednesday’s meeting of the boat line board of governors in Falmouth. “It doesn’t matter to us if one person made a comment or hundreds of people commented [similarly] — we’re going to try to respond to all the comments,” he said. Based on discussions with the Woods Hole business community, Mr. Sayers said, the SSA has already agreed to reduce the terminal’s square footage by cutting back on the food concession area. The expanses of glass seen in the concept design are also being reduced. Once Bertaux + Iwerks revises the design, “the idea is to open it up to the larger community, to get some feedback” in public conversations, Mr. Sayers said. “We could just go ahead and respond to all of this in writing, but that’s not an interactive process and tends to harden people’s positions,” he said. “The idea is to keep it as informal as possible. “Frankly, we’re optimistic we’ll be able to address as many of the concerns as possible,” Mr. Sayers added before inviting Catherine Bumpus of the Woods Hole Community Association to speak. “I hear a lot of frustration from the community,” Ms. Bumpus said. “We were told we’d have input on the design phase of the terminal, but that didn’t happen,” until the design concept was unveiled this fall. “It came as a surprise,” she said. “The community does feel strongly and overwhelmingly that the building should be low, fulfilling its mission to accommodate ticket passengers,” Ms. Bumpus went on. “We feel the village is owed a little bit of accommodation for the disruption and pain the Steamship brings on a daily basis to the village. “We would really like the Steamship to listen to the community on this one,” she concluded. “We are making that commitment,” Mr. Sayers said. After Ms. Bumpus spoke, Falmouth selectman Doug Jones had to introduce himself, although he has attended Steamship Authority board meetings before. While the boat line has been seeking input and consensus from both Woods Hole and Martha’s Vineyard, Mr. Jones said the board of selectmen has been excluded from the conversation. Mr. Sayers said the Steamship Authority would include the Falmouth select board in its outreach. The second major topic at Wednesday’s regular meeting was the upcoming release of an independent review of boat line operations by maritime specialists HMS Consulting of Seattle. A special public meeting has been set for Dec. 17 at 4 p.m. in the Falmouth Public Library to go over the report, which is expected to be finished Dec. 7. Hired in June after a series of high-profile SSA snafus that ranged from a crash of the computerized reservation system to repeated ferry breakdowns and trip cancellations, HMS has conducted extensive interviews with crew members and other staff. HMS also engaged a subcontractor specializing in communications, Rigor Analytics, to review the boat line’s public and internal messaging. But, Mr. Sayers said, due to an apparent “personal situation” Rigor Analytics repeatedly was unable to participate in scheduled video conferences. “Public communications will not be part of this report and we regret that,” Mr. Sayers said. However, he added, the boat line has hired a communications director and established an operations and communication center — two objectives achieved despite the lack of Rigor. Ok so finally the SSA has decided to listen to its customers & neighbors.. Incredible how they keep trying to be so tone deaf until total outrage.. Insane management policy.. Shocking. The SSA whiffs on the two biggest projects it has going on. Nice. Hopefully they take into account how overstaffed they are presently due to their slow adoption of modern technology and rethink additional investment in bricks and mortar while the rest of the world invests in IT. Wasn't "Poor communication with the public" one of the things that made this study necessary? And just like that, the issue is swept under the rug again, and the SSA is planning to accept a report that does not address that issue. The SSA "regrets" that? What a brazen abdication of responsibility. I lived on Nantucket during the process of expanding and renovating of the Airport, later lived on the Vineyard for several years. Whoever handled their outreach did it right - regular, well- advertised meetings, dedicated website, community charrettes, various special events, a model placed in the airport and brought to events, the outreach person available by phone, op-ed columns in the local paper, etc. I urge the Vineyard govt to contact Nantucket and find out who did this outreach and get the architecture team/town to hire them as a liaison. I know for certain that person was part of the architect's team but not an architect. Are you listening Mr. Sayers? This makes a lot of sense to me. And the notion of a “ community charette “ is an idea worth its weight in fresh bay scallops. Everyone is jumping on this bandwagon, but I honestly don’t see the problem. The design is clean and attractive, much more so than the ugly WHOI and NOAA buildings, and a distinct improvement on the old terminal. It is beyond incredible that the SSA never interacted with the Falmouth selectmen. I wonder whether that was the case as well with the huge parking lot expansion and new admin building on Palmer Avenue. That is in precinct 2 in Falmouth. Instead of back to the drawing board, maybe the archs should actually go back to the diving board---or just walk the plank! It seems that the biggest mistake was made by the committee who chose this Architect to do this project. It looks to me like they are selfishly designing the building the Architect’s want instead of coming up with a suitable indigenous design appropriate for this location.